The homeodomain transcription factor Orthopedia (Otp) is essential in restricting the fate of multiple classes of secreting neurons in the neuroendocrine hypothalamus of vertebrates. However, there is little information on the intercellular factors that regulate Otp expression during development. Here, we identified two otp orthologues in zebrafish (otp1 and otp2) and explored otp1 in the context of the morphogenetic pathways that specify neuroectodermal regions. During forebrain development, otp1 is expressed in anterior groups of diencephalic cells, positioned in the preoptic area (PO) (anterior alar plate) and the posterior tuberculum (PT) (posterior basal plate). The latter structure is characterized by Tyrosine Hydroxylase (TH)-positive cells, suggesting a role for otp1 in the lineage restriction of catecholaminergic (CA) neurons. Disruptions of Hedgehog (HH) and Fibroblast Growth Factor (FGF) pathways point to the ability of SHH protein to trigger otp1 expression in PO presumptive neuroblasts, with the attenuating effect of Dzip1 and FGF8. In addition, our data disclose otp1 as a determinant of CA neurons in the PT, where otp1 activity is strictly dependent on Nodal signaling and it is not responsive to SHH and FGF. In this study, we pinpoint the evolutionary importance of otp1 transcription factor in cell states of the diencephalon anlage and early neuronal progenitors. Furthermore, our data indicate that morphogenetic mechanisms differentially regulate otp1 expression in alar and basal plates. The neurosecretory system controls a wide variety of behavioural processes through synthesis and release of different neurotransmitters in the peripheral and central nervous systems [1, 2]. One of the key integrating centers of this organization is the hypothalamus, located in the ventral sector of the diencephalon. However, insights in the development of endocrine neurons has been gained in the midbrain, due to implications with mental and neurological phenotypes that involve growth, reproduction and general homeostasis, and have clinical relevance in degenerative and psychiatric disorders of embryonic origin (e.g. Parkinson's disease and addiction) [3–8]. A wealth of genetic data shows that the combinatorial codes of early instructional cues from Hedgehog (HH), Fibroblast Growth Factor (FGF), and Transforming Growth Factor (TGF-β) extracellular signals mediate differentiation of dopaminergic (DA) neurons in the midbrain [6, 9–15]. Knowledge of the mechanisms of action connecting the prosencephalic signaling pathways, the expression of specific transcription factors and the specification of neuronal individuality during the development of the hypothalamus remains largely unclear . Because of its central contribution to hypothalamic phenotypes during ontogenesis, the homeobox-containing orthopedia (otp) gene may allow a meaningful understanding of signaling cascades [16, 17]. 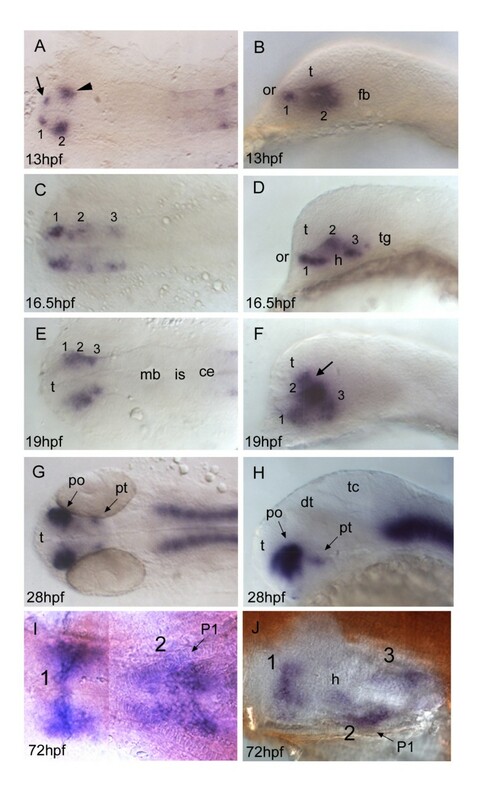 Homologs of otp have been identified in almost all Metazoa, pointing to a conservative and fundamental role in patterning and differentiation [18–28]. In mouse forebrain, Otp is expressed in anterior and posteroventral hypothalamus, retrochiasmatic and supraoptic/paraventricular areas . Otp knock-out mice embryos fail to properly differentiate anterior periventricular, paraventricular and supraoptic nuclei, responsible for secretion of somatostatin, arginine vasopressin, oxytocin, corticotropin-releasing hormone and thyrotropin-releasing hormones [16, 17]. In the diencephalon, Otp acts in parallel with the bHLH-PAS domain factor Sim1 and its dimerizing partner ARNT2, and triggers expression of sim2 and brn2, a POU domain factor [16, 17, 29–32]. It has been shown that otp is a direct target of Brachyury and Spdeadringer transcription factors in vertebrates and invertebrates [33, 34]. Recently, several transcription factors have been proposed as candidates for upstream regulatory interactions with echinoderm otp . Some cases of holoprosencephaly, a congenital disorder with deficiencies in specific groups of CA neurons, are characterized by disruption of sonic hedgehog (shh) and secondary down-regulation of otp, brn2 and sim1, evoking an interaction between otp and shh . Despite all these evidences, the mechanisms of regulation of the Otp gene itself remain largely obscure. We took advantage of the zebrafish to investigate the in vivo functions of shh, fgf8, and ndr2 signaling pathways on otp1 expression by means of morpholino-, mRNA- and mutant-based methodologies. We provide evidence that SHH regulates otp1 neuronal differentiation in the rostral preoptic area (PO) (anterior alar diencephalon), through the antagonistic interaction with FGF and Dzip1, a zinc-finger/coiled-coil domain protein [37–40]. Moreover, we also demonstrate that SHH- and FGF8-independent, Ndr2-dependent transcription of otp1 in the posterior tuberculum (PT) (posterior basal diencephalon) is necessary to trigger CA neuronal fates. 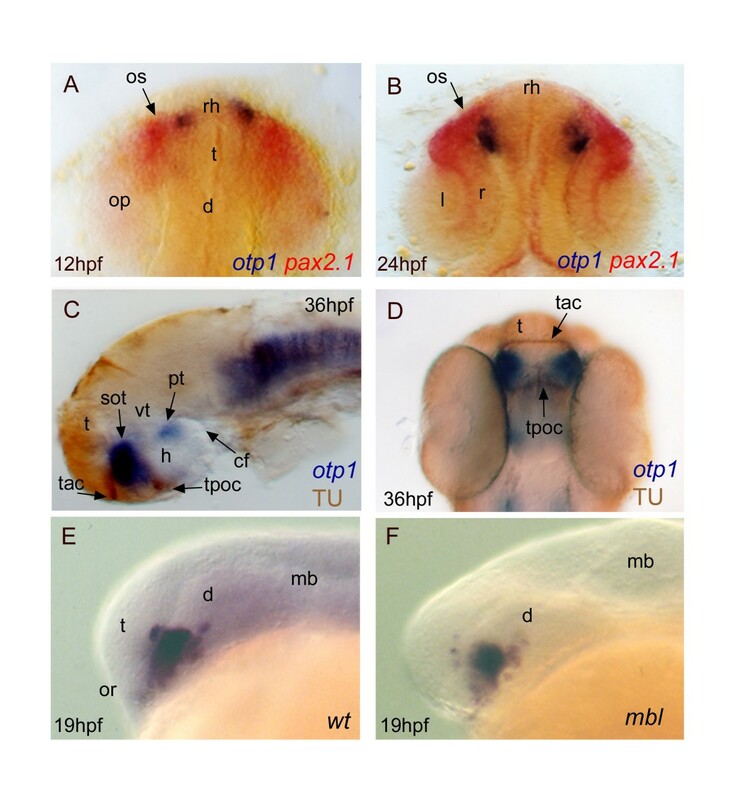 In evolutionary perspectives, functional association between otp1 gene expression and patterning of the diencephalon embodies a primitive condition in the rise of neuronal complexity of vertebrates. To isolate the zebrafish homologue of orthopedia (otp1), a 16–40 hour old zebrafish embryo cDNA library (kindly provided by P. Chambon) was used for a PCR-based screening with degenerate primers. Primers, named ort1_fw (5'-CCNGCNCAGCTSAACGA-3'), and ort2_rv (5'-CKYTTYTTCCAYTTNGC-3'), correspond to PAQLNE and AKWKKR regions of the mouse Otp homeodomain, respectively. Using a semi-nested PCR approach, we isolated a cDNA band of 150 base pairs (bp) encoding a partial homeodomain identical to the corresponding residues in the mouse Otp protein. Gene- and vector-specific primers were used on the same library to isolate the 5' and 3' ends of the mRNA, allowing the identification of a 1823 bp (poly(A) tail excluded) full-length otp1 cDNA containing a 987 bp-long open reading frame (Fig. 1A). 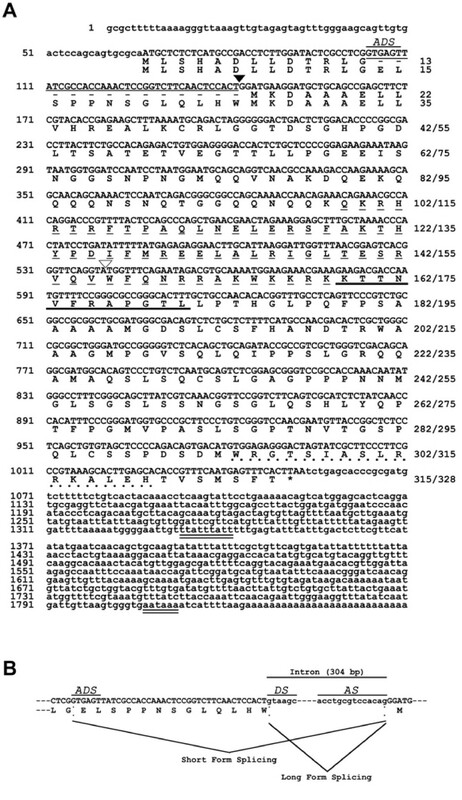 The 5' UTR of the mRNA is 66-nucleotide (nt) long and the first putative AUG codon is located between nt 67 and 69, suggesting the 67/69 AUG triplet as the initiation codon. Therefore, the deduced protein encoded by otp1 is 328 amino acid (aa) long. The mRNA has a UAA stop translation codon at nt 1051 and a 770 nt long 3' UTR region, with one polyadenylation signal (AATAAA) located between nucleotides 1807 and 1812. Organization and transcriptional mechanisms of the zebrafish otp1 gene. A, otp1 mRNA is alternatively spliced and encodes two forms of the protein. On the right are shown the amino acid residues of the short and the long form of Otp1, respectively. The solid arrowhead indicates the position of the 304-nucleotide (nt) intron involved in the alternative splicing. The deleted 39-nt region of the otp1 mRNA resulting in the short form of the protein is shown by a thin solid line. The additional donor site triggering the 39-nt deletion is also indicated (ADS). The open arrowhead points to the position of the second intron. The asterisk indicates the stop codon at the end of the ORF. The AATAAA polyadenylation site and the TTATTTATT motif that mediates mRNA degradation are double-underlined. The thin dashed line marks the homeodomain, the thick solid line marks the conserved 12 amino acids downstream of the homeodomain and the bold dotted line marks the OAR domain. B, Alternative splicing pattern of the otp1 nuclear RNA. The sequences of the donor (DS) and the acceptor sites (AS) of the 304-nt intron are shown, together with the flanking regions of the coding sequence. The alternative donor site (ADS) located in the upstream exon that determines the deletion of the 39-nt region (solid line) is also indicated. The sequence has been submitted to the GenBank/EMBL database under accession number AF071496. During the same screening, a shorter otp1 transcript was also identified that encodes a 315 aa long form of otp1. The two transcripts differ for a 39-nt insertion at 5' end. Interestingly, both human and mouse otp genes have an intron at the same position of the zebrafish otp1 insertion, suggesting that the two isoforms are generated by alternative splicing. Analysis of the zebrafish otp1 genomic region flanking the insertion confirmed the presence of an intron (located between nucleotides 142 and 143 of the longer transcript) at the same position as in human and mouse Otp genes (Fig. 1A). In zebrafish, an additional donor sites generates a shorter mRNA form when a 39-nt fragment at the 3' end of the first exon is spliced out together with the downstream intron (Fig. 1B). RT-PCR experiments and a cDNA library-based PCR screening confirmed the existence of two otp1 transcripts during embryo development (Fig. 3). Genomic analysis of the zebrafish otp1 gene, located bioinformatically on chromosome 15, has been confirmed by PCR, revealing an organization similar to mammalian otp homologs. The gene contains two introns of 304 and 1144 bp, with the first one interrupting the N-terminus of the protein, and the second one located at the very end of the homeobox. Developmental RT-PCR analysis of the otp1 transcripts. Ethidium Bromide-stained agarose gel of RT-PCRs performed using the zotpS and zotpRv primers: DNA Ladder (lane 1), oocyte (lanes 2 and 3), 1–2 cell stage (lane 4), 30% epiboly (lanes 5 and 6), 50% epiboly (lane 7), 8 somite stage (lane 8), 15–20 somite stage (lane 9), 24 hpf (lane 10), 48 hpf (lane 11), brain (lane 12), testis (lane 13), and negative control (lane 14) in absence of cDNA. 80% epiboly, 1–2 somites, and 10 somites samples (not shown) resulted positive after the analysis. On the left of the panel is shown the size of the DNA Ladder bands, on the right is indicated the size of the 2 PCR products, 292 bp and 331 bp, corresponding to the short and the long form of the otp1 mRNA, respectively. otp1 mRNA is characterized by an AU-rich element (ARE) of ~150 nt in length, that lies within the 3' UTR and is located ~200 bases downstream of the stop codon. This ARE contains five copies of the AUUUA sequence, one of which overlaps with the UUAUUUAUU nonamer, that represent the minimal AU-rich motif that is able to destabilize and decay messengers . In silico search of the zebrafish genome using otp1 cDNA as bait provided a second otp gene, named otp2, located on chromosome 2. otp2 ORF is 999 bp long, corresponding to a putative protein of 332 aa. According to mRNA sequences submitted to the NCBI database (accession nos. XM_678094 and XM_701814), the otp2 RNA is alternatively spliced and encodes two discrete forms of mature mRNA. Genomic organization of otp2 is identical to otp1, including presence and position of introns and the additional donor site (data not shown). Zebrafish Otp1 and Otp2 proteins clearly belong to the Otp protein family of transcription factors, and they are likely co-orthologs arisen from the ancient genome duplication event that occurred early in the phylogeny of ray-finned fish [42–45]. The identity of zebrafish Otp homeodomains with Mus musculus, Dugesia japonica and Drosophila melanogaster is 100%, 97% and 95%, while full protein identity with mouse is 78% for Otp1 and 81% for Otp2. In addition, they appear to share the Otp-specific transactivating regions, as well as two additional domains near the terminator codon  (Fig. 1A). The 13 aa stretch resulting from alternative splicing (see above) of Otp proteins is characteristic of the fish lineage (see above). In fact, mouse and human Otp genes lack the additional donor site in the first intron responsible for the alternative splicing of the long protein form. For this reason, the short form of the zebrafish Otp proteins shows higher levels of similarity with mammalian homologs (data not shown). For phylogenetic analysis, we used all available Otp protein and nucleotide sequences, including four ones that were derived from EST and genomic sequence databases (Hydra magnipapillata, Oryzias latipes, Takifugu rubripes and Tetraodon nigroviridis). Otp protein alignment consisted of 591 characters, 408 of which were parsimony-informative. Zebrafish Otp sequences were easily aligned against the rest of the data set mainly within the homeobox domain, including small secondary regions of high similarity. Only these regions were used for the sequence analysis, while the most variable fragments were excluded. The Maximum Parsimony (MP) phylogenetic reconstruction (Fig. 2) resulted in 300 equally parsimonious trees (4458 steps of length; consistency index = 0.73; retention index = 0.76). Maximum likelihood (ML) and Bayesian phylogenetic analyses (data not shown), constrained with the model of protein evolution that fits the data best, (JTT; proportion of invariable sites; Gamma distribution, shape parameter α = 2.318)  were topologically similar to the MP tree. At any phylogenetic reconstruction, the Antennapedia homeodomain region diverges greatly from the other gene clusters, occupying a distinct basal position. Otp, Otd and Otx gene families share an elevated sequence and structural homology in their homeodomain region. Within the Otp gene-family, two sub-clades are highly supported by all phylogenetic reconstruction methods: a vertebrate-specific Otp protein cluster, including fish paralogs, and one including Mollusca, Echinoderma and Hemichordata orthologs. A third sub-clade consisting of D. japonica, D. melanogaster, H. magnipapillata, and Ciona intestinalis Otp gene sequences is not robustly supported in any of the topologies (Fig. 2). Finally, a Otd/Otx gene cluster, distantly related and basal to the Otp gene family, was observed in all phylogenies inferred. Phylogenetic relationship of the Otp gene family. 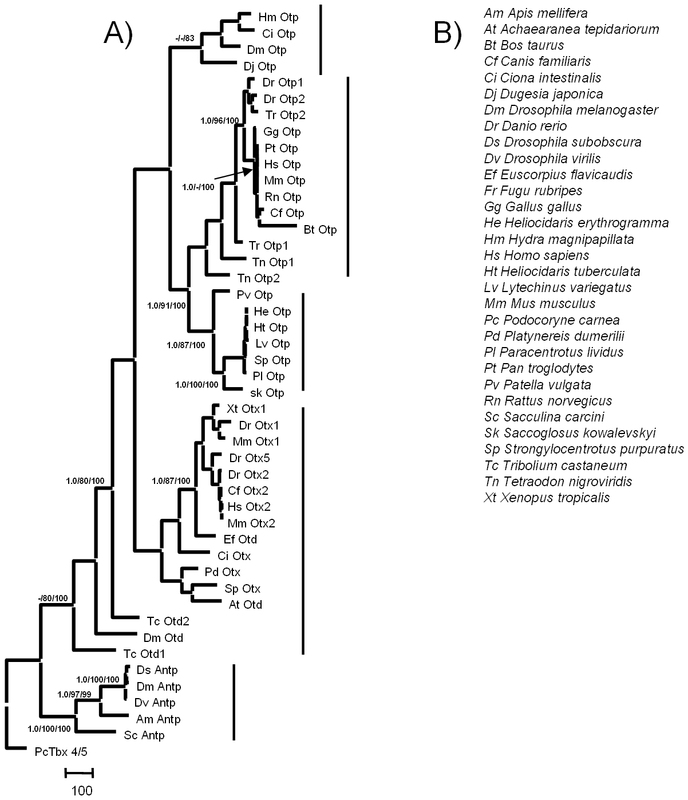 A, MP phylogenetic reconstruction of Otp, Otd, Otx, and Antp protein sequences. BPP/MP/NJ: Bayesian posterior probability, Maximum Parsimony, Neighbour Joining bootstrap support. A dash denotes BPP values below 95% and bootstrap values below 80%. Podocoryne carnea Tbx4/5 protein was used as an outgroup. B, List of taxa with abbreviations (see Methods for accession numbers). We evaluated the presence of the two mRNA forms at different stages by means of RT-PCR using a pair of primers spanning the cDNA region involved in alternative splicing. Both transcripts are already present at the oocyte stage, proving the maternal origin of the transcript, and remain detectable throughout the analyzed stages (Fig. 3). We also report the expression of otp1 in the adult fish, showing for the first time the activity of the gene in the adult brain and in non-neuroectodermal territories (testis). The RT-PCR approach does not recognize trends or relative differences between mRNA forms and developmental stages, supporting the view that splicing of otp1 RNA is not subject to strict regulatory mechanisms (Fig. 3). The spatial and temporal distribution of otp1 transcripts was examined by whole mount in situ hybridization (WISH) following standard protocols with digoxigenin and fluorescein-UTP-labeled probes . Although RT-PCR revealed the presence of maternal and zygotic transcripts, first evidence of otp1 mRNA localization by WISH appears in the forming hindbrain around the 3 somites (s) stage, as a transverse stripe in the prospective rhombencephalon (Fig. 4A). As shown by double labelling with krox20, otp1 expression at 12 s occurs in rhombomeres 3 (r3) and 5 (r5) (Fig. 4B). A histological cross section at the level of the otic placodes shows that rhombencephalic otp1 cells are located in the ventral alar plate of the neural tube, within the mantler layer (Fig. 4C). As somitogenesis proceeds, otp1 expression extends rostrally (Fig. 4D) and then caudally across the hindbrain in the shape of segmentally iterated groups of cells (Fig. 4E). At 34 hours post fertilization (hpf), otp1 transcripts in the hindbrain extend dorsally as parallel stripes in the middle of each neuromeric segment (rhombomere), possibly acting as guidance cues for axonal elongation (Fig. 4H). This hypothesis is supported by spatial comparison of otp1 mRNA with acetylated α-tubulin at 30 hpf, a marker of reticulospinal neurons and corresponding axons in the central part of every rhombomere  (Fig. 4F,G). At 48 hpf, otp1 expression in the hindbrain still persists in every rhombomere without further modifications (data not shown). Zebrafish otp1 expression in the hindbrain. Anterior is left in all images except for C. All views are dorsal except for E, Gand Hthat are lateral. A, At 11 hpf stage, a narrow transverse stripe encompasses the neural tube in its anterior half. During somitogenesis, a second narrow stripe appears more anteriorly (data not shown). B, Double labelling with otp1 (blue) and krox20 (red) shows that otp1 expression in the hindbrain labels rhombomere 3 (r3) and 5 (r5) at 14 hpf stage. This developmental window coincides with the restriction of the two otp1 stripes toward the lateral margins of the neural tube, and with the early extension of the signal throughout the rhombencephalon. C, Transverse section of a 24 hpf stage zebrafish embryo through the hindbrain shows that these lateral clusters belong to the mantle layer of the ventral alar plate and are placed medially along the dorsoventral axis. D, Following (19 hpf), otp1 signals extend anteriorly, and then posteriorly, in the shape of repeated patterns. E, 24 hpf embryo; otp1 mRNA signal localizes in restricted groups of cells, in a pattern reminiscent of rhombomere segmentation. F, G, otp1 WISH combined with acetylated α-tubulin (TU) immunochemical staining confirms that otp1 transcripts occur in paired clusters within each rhombomere (30 hpf) (open arrowheads in Findicate the axons in the central part of every rhombomere). H, At 34 hpf, otp1 domains have elongated dorsally in parallel columns (vertical dashes in E, Fand H, and dashed line in G, indicate rhombomere boundaries and profile, respectively). ce, cerebellum; dap, dorsal alar plate; is, isthmus; n, notochord; ov, otic vesicle; ra, reticulospinal axons; vap, ventral alar plate. Soon after labelling in the hindbrain, a distinct cluster of otp1 transcription appears at the rostral end of the neural tube, in medial position with respect to the optic stalk-specific pax-2.1 positive cells  (Fig. 6A,B). Shortly after, a novel diencephalic domain emerges posteriorly to the previous one (Fig. 5A,B). The foremost, smaller group is located at the boundary with the prospective telencephalon, while the posterior, larger one is observed more laterally, below the optic recess (Fig. 5A,B). At 16.5 hpf, otp1 expression in the hypothalamus has gained further spatial complexity, as shown by the evidence of three main clusters (Fig. 5C,D). The 16 s stage marks the onset of ventral bending of the neural axis at the level of the cephalic flexure, a major morphogenetic process that generates the displacement of forebrain territories at distinct axial levels . In this framework, a spatial rearrangement of the hypothalamic otp1 expression is observed. Apparently, the medial cluster of otp1 expression is displaced dorsally and merges with the anterior one (compare clusters 1–3 in Fig. 5B,D,F). At 24 hpf, otp1 expression in the hypothalamus is established as two domains, one in the anterior alar plate, at the boundary with the telencephalon (areas termed d1 and d2 ), and one in the posterior basal plate of the hypothalamus, in few cells of the posterior tuberculum (PT) extending from the hairpin bend near the cephalic flexure (areas d5 and d6 ) (Fig. 5G,H). At 72 hpf, again three domains of otp1 mRNA distribution are detected in the ventral diencephalon (Fig. 5I,J). otp1 expression in the forebrain. Anterior is always to the left. Except I, a ventral view, right panels are lateral views and left ones are dorsal. Eyes have been removed in Iand J. A, B, About 1 h after early otp1 expression in the hindbrain (11 hpf, see Fig. 4A), a small lateral domain appears at the anterior edge of the central nervous system (arrow) (see also Fig. 6A). Shortly after, a novel center of transcription emerges posterolaterally in the alar plate (arrowhead). C, D, Then, otp1 expression diffuses posteriorly in a segmented fashion with three clusters (1–3) (16.5 hpf). During this developmental phase, spatial rearrangements of the anterior forebrain start occurring as the result of the ventral bending of the neuraxis . Even though intrinsic topological changes in otp1 transcription may also happen, their extents are eventually obscured by morphogenetic dislocations in the neural tube. E, F, At 19 hpf, otp1 positive cells in the middle of longitudinal domains displace dorsally with respect to cells at different axial positions. Consequently, otp1 labelling in the anterior forebrain coalesces in the proximity of the optic recess (arrow). G, H, 28 hpf WISH with a large compacted anterior diencephalic cluster in PO and a small one caudally in PT. I, J, Later in development (72 hpf), otp1 expression is detected in three distinct domains (1–3) in the ventral diencephalon. Unlike early in development, these three clusters are fused along the midline. ce, cerebellum; dt, dorsal thalamus; fb, forebrain; h, hypothalamus; is, isthmus; mb, midbrain; P1, pharyngeal arch 1; po, preoptic area; pt, posterior tuberculum; t, telencephalon; tc, tectum; tg, tegmentum. Topology of otp1 transcripts in forebrain compartments. Anterior is top in A, Band Ddorsal views, otherwise left and lateral view panels. Eyes have been removed in C. A(12 hpf), B(24 hpf), early otp1 expression foci (blue) occur at the anteromedial edge of pax2.1 (red) pattern in the optic stalks, as shown by double WISH. C, D, Co-labelling with anti-acetylated α-tubulin antibody (brown) and otp1 riboprobe (blue) demonstrates that the anterior otp1 cell cluster is delimited by the supraoptic tracts and those of the anterior and posterior commissures (36 hpf). E, F, mbl embryos are not altered in the dorsal extension of the PO otp1 cluster, if compared with control embryos (19 hpf). cf, cephalic flexure; d, diencephalon; h, hypothalamus; l, lens; mb, midbrain; op, optic primordia; or, optic recess; os, optic stalks; r, retina; rh, rostral hypothalamus; sot, supraoptic tract; t, telencephalon; tac, tract of the anterior commissure; tpoc, tract of the postoptic commissure; vt, ventral thalamus. At 24 hpf, transversal histological sections show that the anterior diencephalic domain belongs to the non-germinal (mantler) layer (data not shown). Coupling otp1 WISH with acetylated α-tubulin immunostaining, a marker of major axonal traits in the embryonic CNS, proves that the anterior otp1 cluster is enclosed in the preoptic area (PO) (alar plate) by the tracts of the anterior and postoptic commissures, and it extends toward the trait of the supraoptic commissure (Fig. 6C,D). Due to this dorsal extension in the supraoptic region, we addressed otp1 expression at the telencephalic-diencephalic boundary using masterblind (mbl) mutants. In mbl embryos, several forebrain defects are observed, such as absence of optic vesicles, olfactory placodes, clusters of primary telencephalic neurons, anterior and postoptic commissures [52–54]. Despite profound alterations in the telencephalic structures, no significant changes are detected in the PO cluster of otp1 expressing cells in comparison with wt embryos at 20-s stage, suggesting that otp1 expression does not occur in the telencephalon (Fig. 6E,F). The cyclops (cyc) embryos carry mutations in the nodal-related 2 (ndr2) gene that alter the development of ventral CNS structures, with a severe phenotype in the rostral brain [55–58]. Analysis of otp1 expression in 24 hpf cyc embryos with intermediate phenotypes (reduction of the ventral diencephalon and partial fusion of the eyes) shows a reduced size and midline blending of the PO domain. Interestingly, no otp1 expression occurs in the PT of cyc embryos (Fig. 7A,B). To answer whether this result is determined by impaired development of the otp1-expressing cells or by absence of the prosencephalic ventral structures where the otp1-positive neurons normally form, we microinjected ndr2 synthetic mRNA and analyzed the effects on the expression profile of otp1 in the PT area (Fig. 7C–F). In accordance with the absence of otp1 signal in cyc embryos with intermediate phenotypes, ndr2 overexpression induces a moderate expansion of the PT-specific otp1 domain (up to 25% of the injected embryos) (compare Fig. 7C with 7E, and Fig. 7D with 7F). Nodal and FGF signalings are related with otp1 in the diencephalon. Anterior is left in all but J-Mpanels. J-Mpanels are frontal views, B, Dand Fare dorsal, and the remaining ones are lateral. A, B, Nodal signals emanating from mesendoderm and overlaying neuroectoderm represent one of the most important inducing pathways that govern regional patterning of the neural tube. Zebrafish cyclops (cyc) mutant embryos lack a functional floor plate, and indirectly disrupt HH signaling [55, 56, 57, 58]. At 24 hpf, cyc mutants display complete loss of otp1 expression in the PT, and show an asymmetric reduction of PO domains (arrow). Forebrain and hindbrain patterns are closer or fused along the midline (arrowhead). C-F, Accordingly, the essential role of Nodal signaling in otp1 transcription in the posterior hypothalamus is confirmed by microinjection of ndr2 mRNA whereas, compared with controls (C, D), otp1 domain in the PT is expanded (E, F) (arrowhead in C-Findicates the PT-specific otp1 expression) (32 hpf). G-I, Double WISH reveals that fgf8 (red) and otp1 (blue) expression patterns are complementary at the boundary between prospective telencephalon and diencephalon since early somitogenesis stages (G, 5 s).H, At 24 hpf, PO otp1 expression is adjacent to fgf8-positive optic stalks (arrow). I, A high power image of Hillustrates the physical proximity of otp1 and fgf8 transcripts. J, K, fgf8 gene activity is abolished in acerebellar (ace) mutant . Examination of an optic section of ace embryos at 28 hpf through the optic area shows that the PO-specific otp1 cluster is expanded radially (K) in comparison with controls (J). L, M, Overexpression of fgf8 induces a reduction of the number of otp1 expressing cells in the PO, whereas this cluster also fails to properly coalesce, likely due to developmental delay (19 hpf). On the contrary, the PT-specific otp1 domain is unaltered (data not shown). cf, cephalic flexure; d, diencephalon; dt, dorsal thalamus; fb, forebrain; h, hypothalamus; mb, midbrain; mhb, midbrain-hindbrain boundary; or, optic recess; os, optic stalks; t, telencephalon; tc, tectum; tg, tegmentum; vd, ventral diencephalon; vt, ventral thalamus. FGFs released from the isthmus and other organizing centres are required to pattern the neuroepithelium along its dorsoventral and anteroposterior axes [59, 60]. In zebrafish embryo, tissues expressing fgf8 are observed in close proximity with the otp1 cluster in PO (Fig. 7G–I). Herein, the specification of otp1 cells in the PO is repressed in 13 to 24% of the embryos at 19 hpf that overexpress FGF8 (Fig. 7L,M). The same cluster is expanded in fgf8 (acerebellar, ace) mutant embryos at 28 hpf (Fig. 9A,B). On the contrary, PT-specific otp1 expression is not altered in both ace embryos and following fgf8 overexpression (Fig. 9B; data not shown). Synergicistic effects of HH and FGF signaling on otp1 expression in the PO cluster. Anterior is left and dorsal is up in all panels. Eyes have been removed in A. All embryos are 28 hpf and have been double stained with otp1 riboprobe and anti-acetylated α-tubulin (TU) antibody. Compared with the wild-type PO (A), the anterior otp1 cluster is expanded and reduced, respectively, in ace (B) and syu (C), but its normal size is rescued in double ace; syu mutant embryos (D). cf, cephalic flexure; dt, dorsal thalamus; h, hypothalamus; po, preoptic area; pt, posterior tuberculum; sot, supraoptic tract; t, telencephalon; tac, tract of the anterior commissure; tpoc, tract of the postoptic commissure; vt, ventral thalamus. Searching for regulative interactions between otp1 and HH factors, we first compared expression patterns of shh and patched-1 (ptc1), a Shh-specific receptor [38, 61], with otp1. In the prospective diencephalon, otp1-positive cells lie at the ventro-lateral edges of ptc1 and shh expression domains, therefore in a region exposed to elevate HH concentrations (Fig. 8A–D). Effects of synthetic shh mRNA injections on otp1 expression were analysed at 17 and 20 hpf of development (Fig. 8E–K). The majority of embryos injected with synthetic shh mRNA exhibits a disorganized otp1 expression pattern in the hypothalamus. Interestingly, dorsalization of otp1-positive cells does not extend to the thalamus, except for two peculiar cells (Fig. 8H,J). Ectopic otp1 expression is also observed in the optic vesicle  (Fig. 8I). In the hindbrain of shh-overexpressing embryos, otp1 transcripts are still orderly arranged although as a single domain per rhombomere (compare Fig. 8K with Fig. 4E). Relationships between otp1 and HH signaling in the diencephalon. Anterior is to the left in all panels except for D, I, O-Qwhere anterior is up. The latter panels, Band Jare dorsal images, while the remaining ones are lateral views.A-D, Relative distribution of otp1 and shh signaling factors, i.e. shh and its receptor patched-1 (ptc1). A, B, Co-staining of ptc1 (red) and otp1 (blue) mRNAs at 17.5 hpf stage reveals that otp1 expression is included in the shh-pattern, where they are placed at the ventrolateral margins. C, D, Likewise, double labelling of shh (red) and otp1 (blue) at 28 hpf shows coexpression near the optic stalks, as seen in the close-up (D). E-K, Overexpression of synthetic shh mRNA at 1–2 cell stage induces dorsalization of otp1 positive cells. E, F, Since early otp1 expression, forced shh expression induces an initial dorsal displacement at the rostral edge of the diencephalon, without significant alteration of cell number (17 hpf). G, H, A comparable number of otp1 positive cells in both the PO (arrow) and the PT (arrowhead) are dorsalized at later stages of brain development (20 hpf). I, shh overexpressing embryos shown in Hdisplay abnormal expression in the optic vesicle (arrowheads). J, In addition, ectopic expression of otp1 is consistently found in two symmetrical cells in the dorsal thalamus (open arrow in H, arrows in J). K, The repeated pattern of otp1 expression in the hindbrain is maintained, but it now appears as a single median cluster per each rhombomere, and it does not extends dorsally (vertical dashes correspond to rhombomere boundaries; compare with Fig. 4E, F-H). L-Q, otp1 expression in 28 hpf zebrafish mutants lacking shh (syu) and the HH-inhibitor Dzip-1 (igu). Labelling of PO cells indicates that the size of the otp1 cluster is (M, P) reduced in syu and (N, Q) enlarged in igu as well, if compared with (L, O) control embryos. In both mutants, no significant alteration of the otp1 cluster in PT is observed (arrowheads in L-N). cf, cephalic flexure; d, diencephalon; dt, dorsal thalamus; fb, forebrain; fp, floor plate; mb, midbrain; l, lens; or, optic recess; os, optic stalks; r, retina; t, telencephalon; vt, ventral thalamus. 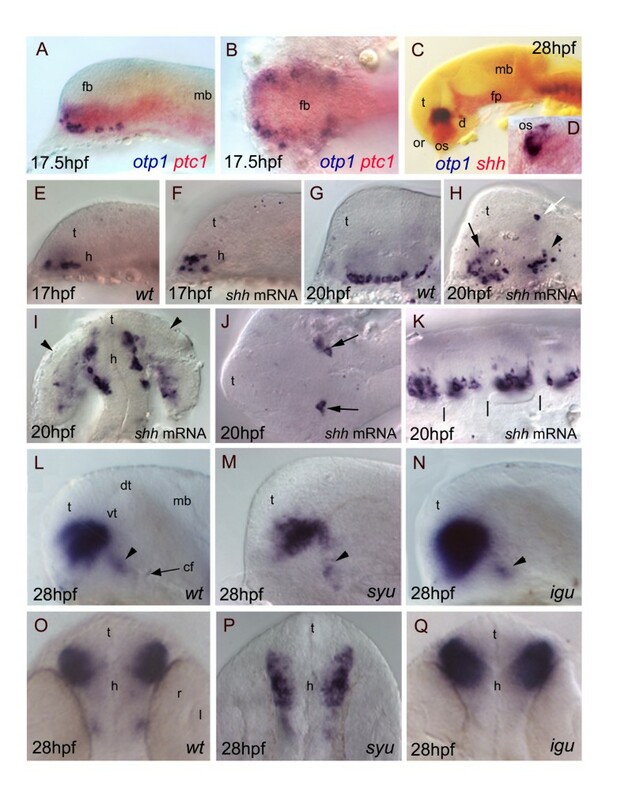 Then, otp1 expression was studied in sonic you (syu) and iguana (igu) mutant embryos, zebrafish strains characterized by functionally null alleles of, respectively, shh  and the dzip1 gene, a negative regulator of HH signaling gradients [39, 40]. In 28 hpf syu mutants, the PO otp1 pattern is drastically reduced in size (Fig. 8L,M,O,P; Fig. 9A,C). On the contrary, loss of Dzip1 functions in igu embryos induces a phenotype characterized by supernumerary PO otp1-positive cells (Fig. 8L,N,O,Q). In both mutants, no obvious alterations of otp1 expression are observed in the PT (Fig. 8L–Q). Direct interactions between FGF and HH signaling were approached by WISH analysis of otp1 transcripts in ace; syu double mutant embryos, in which PO or PT clusters of otp1 expression are not significantly altered (Fig. 9A,D). Among populations of CA neurons described in the zebrafish brain during development, the PT hosts distinct groups of DA neuroblasts [63–66]. Our data support the notion that otp1 transcription in the PT is functionally linked with a population of DA neurons. Double labelling of otp1 mRNA and TH, a marker of CA neurons in the diencephalon, shows that a fraction of the DA neurons placed in the PT, adjacent to the ventral flexure, express otp1 (Fig. 10A,B). Moreover, the zebrafish mutant motionless (mot) features a reduction of DA neurons in the PT . Accordingly, the number of otp1 positive cells is sharply decreased in this region in mot embryos at 34 hpf (Fig. 10C,D). Finally, inactivation of otp1 translation by microinjection of ATG-targeted morpholino oligonucleotides at 1–2 cell stages causes a marked loss of TH-positive cells in the PT (Fig. 10E,F). otp1 functions and CA neuron differentiation. Anterior is left and dorsal is up (except for B, dorsal view) in all panels. Eyes have been removed. A, B, anti-TH antibody labels the PT diencephalic CA neurons at 38 hpf . Co-labelling with otp1 is evident in a fraction of TH-positive neuroblasts in the PT (arrowhead). 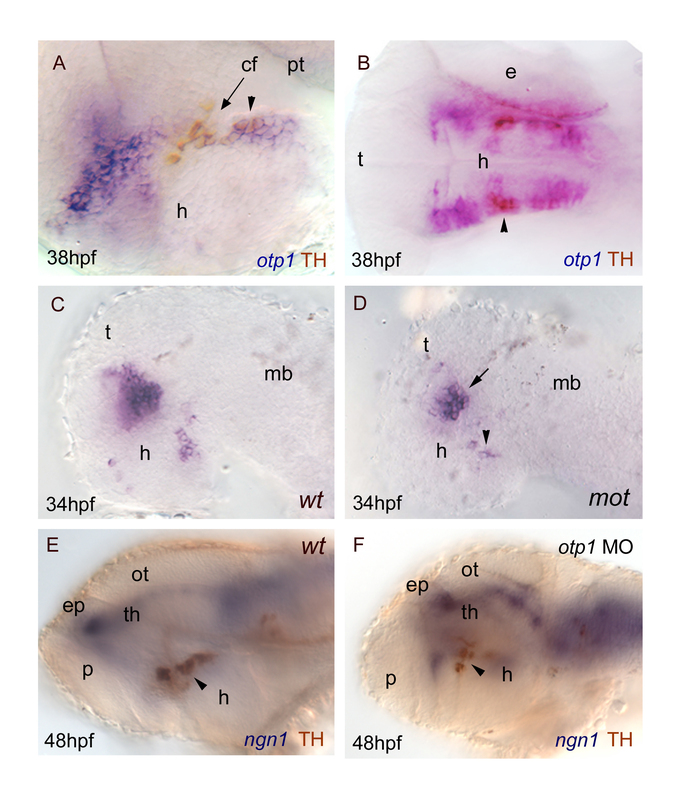 C, D, motionless (mot) embryos display a severe reduction of cell numbers across all DA populations of the zebrafish brainstem, including the diencephalic ones (34 hpf) . Herein, absence of mot functions drastically inhibits the differentiation of otp1 positive cells, more in the PT (arrowhead) then in the PO (arrow). E, F, microinjection of otp1 morpholino oligonucleotide lowers the number of TH-labelled DA neuroblasts in the PT (arrowhead) of 48 hpf embryos that were labelled with neurogenin1 (ngn1), a marker of specific neuronal populations in the forebrain. cf, cephalic flexure; e, eye; ep, epiphysis; h, hypothalamus; mb, midbrain; ot, optic tectum; p, pallium; th, thalamus. 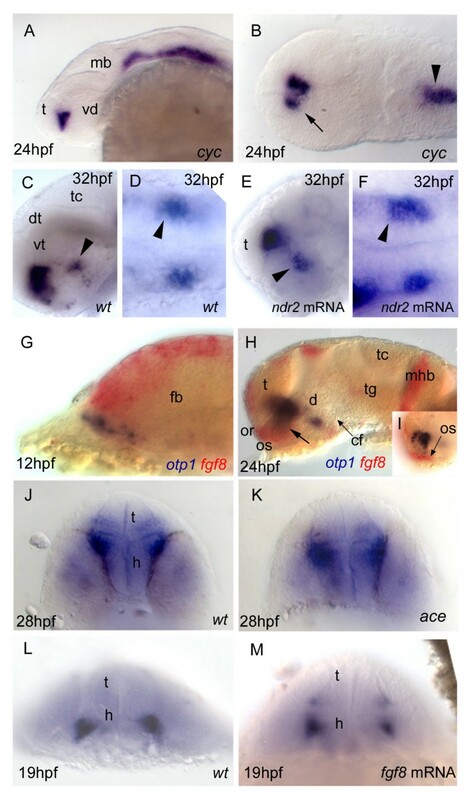 Orthopedia (Otp) expression in vertebrate embryos is crucial for the correct determination of several cell lineages in the neuroendocrine hypothalamus [16, 17]. Indeed, Otp null-mice die soon after birth due to the developmental failure of the anterior periventricular, paraventricular, and supraoptic hypothalamic nuclei, and the resultant incapability to secrete important neuro-hormones [16, 17]. 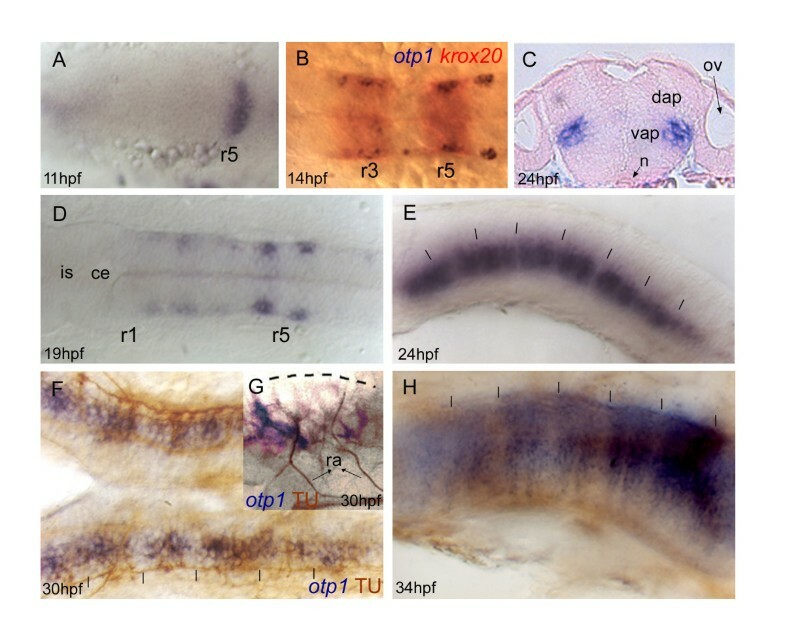 In zebrafish, a detailed characterization of the CA neurotransmitter pathway makes this organism a favourite model system to address the ontogeny of the vertebrate neurosecretory system [63, 64, 66–77]. To investigate otp regulation in vertebrate development, we have isolated two otp zebrafish homologues (otp1 and otp2) and investigated the in vivo functions of shh, fgf8, and Nodal-related 1 signaling pathways on otp1 expression by means of morpholino-, mRNA- and mutant-based methodologies. The conservative structure of the homeodomain region uncovered between the zebrafish Otp1, Otp2 proteins and the rest of our data set indicates clearly that the above proteins represent members of the Otp gene family of transcription factors. The percentages of identity between the zebrafish Otp homeodomains compared with the ones in Mus musculus, Dugesia japonica and Drosophila melanogaster are found to be variable, reflecting distinct evolutionary relationships as well as functional differences. Moreover, each of the Antp, Otp, and Otd/Otx gene clusters represent phylogenetically distinct clades characterised by elevated levels of sequence and structural homology. Our phylogenetic analysis of Otp proteins highly supports a Vertebrate group, while it highlights two unorthodox subclades, one consisting of Molluscs, Echinoderms and Hemichordates, and one grouping Platyhelminthes, Cnidarians and Arthropods and Tunicates. otp1 gene expression domains are in close proximity to, or within, organizing centres that express signaling factors. In this report, we show that Nodal, SHH and FGF8 independently regulate otp1 expression during formation of neural stem cells in the zebrafish forebrain. Since results presented herein centred on functional effects occurring within the first 2 days of development, TH-immunolabeling did not evidence neurons in the PO during our assays, therefore impeding to connect otp1 activity with CA neurons in the anterodorsal hypothalamus. However, we report the first case of involvement of otp in the determination of a subgroup of ventral hypothalamic CA neurons. HH and FGF8 signaling pathways play key roles in the ventral CNS patterning [78, 79]. Our examination of syu, igu, and ace mutants clearly revealed the dependency of otp1 expression on shh and fgf8 at the level of the otp1 positive cluster located in the PO, where the two signaling molecules are synthesized. Absence of Shh protein determines a marked attenuation of the size of the otp1 cluster in the PO (alar plate) (Fig. 8L,M,O,P) [37–40]. This result suggests that only the prospective otp1-positive cells in the alar plate PO have acquired the competence (i.e. additional factors that modulate SHH signaling) to respond to the high SHH concentration from the ventral neural tube and then trigger otp1 expression. This is also supported by the evidence that the PO otp1 signal increased in igu mutants (Fig. 8L,N,O,Q), which are deficient in shh negative regulation [39, 40]. Inhibition of the SHH pattern via synthetic mRNA microinjection causes profound alterations in the spatial organization of the PO otp1 cluster, but does not induce relevant changes in the number of the otp1-expressing cells, suggesting that otp1 responsiveness in the alar plate is dependent on additional positive regulators rather than negative factors hindering SHH signal propagation. Interestingly, ectopic otp1 expression after shh microinjection was selectively observed in the optic placodes (Fig. 8I) and in one fixed pair of cells in the roof of the dorsal thalamus (Fig. 8H,J), suggestive of a predetermination to respond to the shh signal. The otp1 signal in the PO appeared significantly expanded in the ace mutant (Fig. 9A,B), indicative of a negative role for this signaling factor in the control of PO otp1 expression. To confirm this observation we altered the endogenous level of fgf8 by synthetic mRNA microinjection: excess of FGF concentration reduces the size of the otp1-positive PO cluster. As expected from a potential negative regulator, fgf8 microinjection does not induce ectopic expression of otp1. No major consequences on otp1 expression in the PT are noticed in embryos altered in FGF and SHH signalings (Fig. 8M,P; Fig. 9B,C; data not shown), supporting the conclusion that fgf8 and shh are not required for otp1-based neuronal specification in the posterior diencephalon. The ndr2 mutant cyclops (cyc) interferes with the Nodal pathway causing massive defects in the rostral brain [55–58]. Analysis of otp1 expression in cyc mutant embryos with intermediate phenotypes (reduction of the ventral diencephalon and partial fusion of the eyes) shows midline fusion of PO-specific otp1 expression; moreover, we noticed that the domain is decreased in size (compare Fig. 7A,B with Fig. 5G,H). This phenotype could be in part explained by the partial physical deficiency of the PO territory, but also by the repression of shh transcription in cyc mutants , such that the reduction of otp1-expressing cells after the disruption of Nodal signaling is determined by intrinsic loss of shh (as we observed in syu mutants) (Fig. 8M,P), pointing to the PO otp1 expression regulation mediated by ndr2. We did not detect any otp1-expressing cells in the PT of nodal (cyc) mutant embryos. This phenotype is not caused by shh deficiency since otp1 expression in the posterior basal plate of the hypothalamus is not modulated by HH signaling, but could be determined by the absence of the prosencephalic ventral structures. This issue has been addressed overexpressing ndr2 and analyzing the effects on otp1 transcription in the PT area. Increase of Ndr2 function is shown to determine the expansion of the PT-specific otp1 domain (Fig. 7C–F), in accordance with the opposite effect in the PT of cyc embryos with intermediate phenotypes. Taken together, these results are indicative of Nodal signaling as a positive regulator of otp1 expression in the posterior basal plate of the hypothalamus. Furthermore, Holzschuh and colleagues reported the loss of diencephalic DA neurons also in MZsur, a Nodal mutant in which the PT correctly develops, therefore suggesting the direct involvement of Nodal in the differentiation of the DA neuron in the posterior tuberculum [81, 82]. In this context, our findings allow to propose that the Nodal contribution to the development of the CA neurons in PT might be mediated by otp1. Because both otp1- and TH-positive neurons occur in the PT, we co-labelled this area. Interestingly, otp1 and TH partially overlap in a small clade of neuronal precursors (Fig. 10A,B). In these cells, otp1 activation precedes of several hours that of dopamine transporter and tyrosine hydroxylase genes . In addition, embryos of a zebrafish mutant that displays a reduced number of hypothalamic DA neurons (motionless, mot)  show less otp1-positive neurons (Fig. 10C,D). The hypothesis of a subset of CA neurons requiring otp1 action for their differentiation was finally tested by microinjection of otp1-specific ATG-targeted morpholino oligonucleotides in wild type embryos. A mot mutant phenocopy was generated at the PT level, with the repression of TH-positive cell differentiation (Fig. 10E,F). Altogether, these data confirm the otp1 gene as one functional milestone towards the correct development of the CA system. In this paper we provide strong circumstantial evidence of regulatory links between otp1 expression and Nodal, SHH and FGF signaling cascades in the hypothalamus. The first piece of evidence demonstrates that Nodal, in concert with fgf8 and shh, mediates otp1 expression in the preoptic area (Fig. 11). Remarkably, our data indicate a second signaling mechanism in which nodal, but not fgf8 and shh, regulate early otp1 functions in the determination of CA neurons in the posterior tuberculum (Fig. 11). The identification of otp1 as a key component in the differentiation of diencephalic CA neurons will help in clarifying the developmental bases of several human behavioural aspects as well as pathologies such as addictions and Parkinson's disease. Schematic representation of the spatial and functional links between otp1 expression and Nodal, SHH and FGF signaling cascades in the 24 hpf hypothalamic forebrain. A, schematic lateral view of the zebrafish forebrain with anterior to the left and dorsal up. otp1, fgf8 and shh expression domains are painted with different colors (purple, otp1; blue, shh; red, fgf8). B, presumptive Nodal, HH, and FGF signaling cascades genetic interactions regulating otp1 expression in the two hypothalamic areas indicated by solid arrows. otp1 expression in PO is modulated negatively by FGF8 and positively by SHH; the effect of SHH on otp1 expression is diminished by Dzip1, a negative regulator of SHH signaling, and Nodal activates otp1 expression through SHH. In PT, otp1 expression is independent from HH and FGF signaling cascades, but it is activated by Nodal in a HH-independent way. Nodal-dependent otp1 expression in PT is required for the proper differentiation of a subset of CA neurons. cf, cephalic flexure; d, diencephalon; or, optic recess; os, optic stalks; po, preoptic area; pt, posterior tuberculum; t, telencephalon. Wild type zebrafish of the AB strain were maintained at 28°C on a 14 h light/10 h dark cycle under standard procedures . Embryos were collected by natural spawning, staged according to Kimmel and co-workers  and raised at 28°C in fish water (Instant Ocean, 0,1% Methylene Blue) in Petri dishes . We express the embryonic ages in somites (s) and hours post fertilization (hpf). The following mutant alleles were used: aceti282a , cycb16 , mbltm213 , motm807 [39, 40], syutbx392  and iguts294e [39, 40]. The zebrafish homologue of orthopedia (otp1) has been isolated by means of PCR from a 16–40 hour old zebrafish embryo cDNA library using degenerate primers ort1_fw (5'-CCNGCNCAGCTSAACGA-3') and ort2_rv (5'-CKYTTYTTCCAYTTNGC-3'), corresponding to PAQLNE and AKWKKR regions of the mouse Otp homeodomain, respectively. The first round of PCR has been carried out using the ort2_rv degenerate primer with the T3 library-vector specific primer. An aliquot of this reaction has been used as template with the ort1_fw and ort2_rv primers. The 150 bp cDNA band obtained encoded a partial homeodomain identical to the corresponding residues of the mouse Otp protein. Gene- and vector-specific primers were used on the same library to isolate the 5' and 3' ends of the otp1 mRNA. A total of 47 sequences, gathered from several EST and genomic databases, were aligned using the ClustalW algorithm  as implemented in the Bioedit software v4.7.8  under a variety of gap penalties assigned. Species names, abbreviations, gene names and accession numbers of the sequences are as follows: Bt, Bos taurus, Otp XM_604218; Gg, Gallus gallus, Otp AY651764; Cf, Canis familiaris, Otp XM_546055, Otx2 XM_547830; Pt, Pan troglodytes, XM_517691; Hs, Homo sapiens, Otp NM_032109, Otx2 NM021728; Mm, Mus musculus, Otp CAA71439; Rn, Rattus norvegicus, Otp XP_215445; Dr, Danio rerio, Otp1 AF071496, Otx1 NM131250, Otx5 NM_181331; Dm, Drosophila melanogaster, Otp NM_206187; Pd, Platynereis dumerilii, Otx AJ278856; Sp, Strongylocentrotus purpuratus, Otp XM_779506, Otx NM_214588; At, Achaearanea tepidariorum, Otd AB096074; Tc, Tribolium castaneum, Otd1 NM_001039424, Otd2 NM_001039437; Ci, Ciona intestinalis, Otp AB210618; Ef, Euscorpius flavicaudis, Otd AY738138; Xt, Xenopus tropicalis, Otx1 NM_203885; Sk, Saccoglossus kowalevskii, Otp AAP79292; Pv, Patella vulgata, Otp AF440099; Lv, Lytechinus variegatus, Otp AAR17090; Pl, Paracentrotus lividus, Otp O76971; Ht, Heliocidaris tuberculata, Otp AAS00592; He, Heliocidaris erythrogramma, Otp AAS00591; Ds, Drosophila subobscura, Antp X60995; Dv, Drosophila virilis, Antp AY333070; Am, Apis mellifera, Antp NM_001011571; Sc, Sacculina carcini, Antp AF393443; Pc, Podocoryne carnea, Tbx4/5 AJ581006. While Dugesia japonica (Dj) Otp sequence was obtained directly from Umesono and co-workers , Hydra magnipapillata (Hm), Takifugu rubripes (Tr) and Tetraodon nigroviridis (Tn) Otp sequences were generated in the course of this study and are available from the authors. The alignment was manually refined and used as the basis for all tree reconstruction methods. Maximum parsimony (MP) analysis was carried out in PAUP* 4.0b10 (Windows version)  using the heuristic search option, 100 random sequence additions and tree bisection-reconnection (TBR) branch swapping. Maximum likelihood (ML) analysis was performed using the quartet puzzling method  implemented in the TREE-PUZZLE package (version 5.0)  using the heuristic search option and ten random sequence additions. A Bayesian phylogeny was inferred, and posterior probabilities of individual clades were calculated using a variant of the Markov chain Monte Carlo algorithm as employed in MrBayes v3.1.2 . Four Markov chains (three heated, one cold) were run for 200000 generations using random starting trees and the same model employed in branch length estimates, with trees saved every 100 generations. Bootstrap support for individual nodes  was calculated on 1000 replicates using the same methods, options and constraints as in the tree-inferences, but removing identical sequences. Maximum Likelihood and Bayesian phylogenetic reconstructions were constrained with the most appropriate model for protein evolution that better fitted the data. Likelihood values for each of 64 candidate models of protein evolution with the best-fitting parameters (gamma distribution, proportion of invariable sites, character frequencies) were computed in the software ProtTest v1.3 . The best aminoacid replacement model for the data was finally calculated using an Akaike (AIC), a second-order Akaike (AICc) and a Bayesian (BIC) information criteria. Total RNAs from 15 samples corresponding to 10 different developmental stage embryos (1–2 cells, 30% epiboly, 50% epiboly, 80% epiboly, 1–2 somites, 8 somites, 10 somites, 15–20 somites, 24 hpf, and 48 hpf) and 3 adult organs (oocyte, brain, testis) were purified, DNase treated, and reverse-transcribed. The cDNAs obtained were tested for the presence of otp1 expression using the forward (zotpS: 5'-ATGCTCTCTCATGCCGACCT-3') and reverse (zotpRv: 5'-TCTGTTGGTTTTGCTGGCCG-3') primers spanning the cDNA region involved in alternative splicing. The products of the PCRs were loaded and resolved onto 2% agarose gels. WISH hybridization was carried out according to Thisse and co-workers  on embryos fixed for 2 h in 4% paraformaldehyde/phosphate buffered saline, then rinsed with PBS-Tween, dehydrated in 100% methanol and stored at -20°C until processed for WISH . Riboprobes were in vitro labelled with digoxigenin or fluorescein (Roche). For double WISH and antibody labelling, WISH was performed first, then embryos were exposed to rat anti-Tyrosine Hydroxilase (TH) (Chemicon) and mouse anti-acetylated α-tubulin (Sigma). Embryos incubated with anti-TH were treated with biotinylated secondary antibody (Vector Laboratories). Synthetic capped shh, ndr2, and fgf8 mRNAs were injected repeatedly (n > 3) at concentrations of 400, 200, and 200 pg per embryo, respectively. Injections were carried out on 1- to 2-cell stage embryos. To repress otp1 mRNA translation, an ATG-targeting morpholino was designed (Gene Tools, LLC): 5'-CCAAGAGGTCGGCATGAGAGAGCAT-3'. Luca Del Giacco, Paolo Sordino contributed equally to this work. The authors wish to gratefully thank S. Wilson and S. Guo for providing mutant embryos, and A. Barth for plasmids. We are indebted with F. Aniello, M. Studer and S. Barabino for critically reading the manuscript. LDG thanks S. Duga and S. Diani-Moore for their priceless support, and U. Fascio (C.I.M.A.) for assistance at the confocal microscope. This work was supported by grants from "MIPAF V-VI Piano Triennale" (FC), "CARIPLO N.O.B.E.L." (FC), "EC" (PS, NA), "MIUR" (PS, RT), and "EMBO" (PS). FC dedicates this paper to the illuminating memory of Alberto Monroy, twenty years after his death. LDG and PS designed the study, carried out the wet and in silico cloning procedures, the molecular genetic and functional studies, and drafted the manuscript. AP and RT carried out some of the molecular genetic and functional studies. BDB participated to the identification of otp1 and preliminary expression analysis. NA carried out sequence alignments and evolutionary analysis. FC participated in the design and coordination of the study. All authors read and approved the final manuscript.